Comfy and stylish jackets are an absolute essential, and what better look than the retro men's bomber jacket. 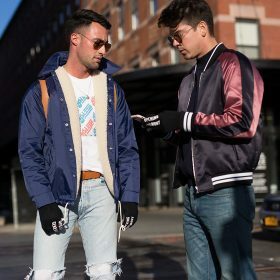 With variety of styles, materials, colors and brands, bomber jackets are an all time favorite for many. Want something a bit more edgy? Look for leather bomber jackets or men's leather jackets. Want something a bit lighter and softer instead, the collection of men's denim jackets is endless! Whilst these are quite light jackets, search through men's winter jackets for something a bit warmer.